Bringing together therapists and patients! On a platform for lymphedema therapy. “Bringing together therapists and patients! 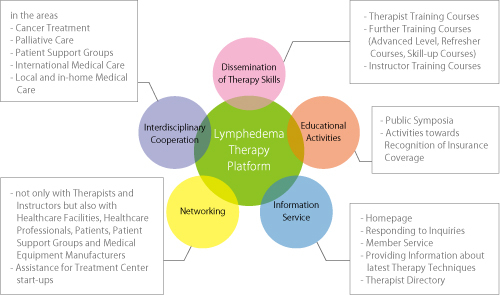 Our philosophy includes the image of a platform on which accurate information as well as expertise on lymphedema therapy is provided. This platform shall be created in a manner that brings together patients, their families, therapists, medical doctors, health care professionals, medical equipment manufacturers and supporters to provide and share their respective knowledge. Our task is to provide all information correctly and impartially. Copyright © 2011-2012 Medical Lymphdrainage Association of Japan. All Rights Reserved.